When putting together a logo branded USB pen drive project, often the last thing on the check list is the data. USB flash drives can be a very effective if pricey marketing tool. But when compared to a DVD duplication run for delivering marketing or promotional presentations the emphasis is often on the medium and not the message. Marketing agencies will often spend thousands on the highest quality printed USB sticks then at the very last minute copy some hastily created Microsoft Word documents for distribution. With such a flexible and capable medium this is a great waste of its capabilities. If your company or brand has a promotional video then why not add this to the USB stick? For example a WMV or other compatible window media file will be playable by over 90% of users. Avoid Mac specific files such as QuickTime as these will need software installed on the host machine. You can fit about one hour’s worth of good quality video on a 1GB USB pen drive. Web links are a very useful way of not only directing the recipient of your promotional gift to your website but with some simple web programming they have the added advantage of allowing you a way of measuring the success of your promotion. 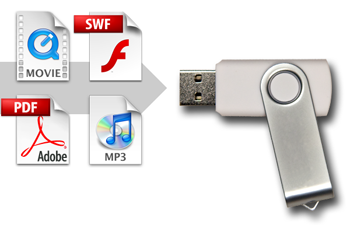 A cut down USB key with very little memory (in order to reduce the cost) and a simple web link makes a very cost effective promotion (these are sometimes known as ‘USB webkey’). PowerPoint, although fairly basic in terms of multimedia possibilities, can nonetheless incorporate embedded media such as video or audio with basic transitions to keep the interest going. Data from Excel spreadsheets and web pages can be cut and pasted to create information rich presentations. Even Acrobat these days is capable of web links, embedded media and other fancy additions like password protection. Adobe Flash and Director are the top end of this scale and the possibilities that both these applications allow are endless. Adobe’s advanced programming languages action script makes it possible to build applications and run these from your USB pen drive. Games, fully interactive presentations, apps that integrate data from your website and utilities that can make operating system tweaks or function calls are all possible. If your company does not have the in-house capabilities then an outside agency will be needed to provide the content authoring on more ambitious projects like this. One minor caveat with all these options is the autorun functionality that can be used to automatically load applications or documents when the USB key is inserted into the port on your PC. Due to the dangers of automatically running virus or malware applications from USB sticks most corporate anti virus systems block any such activity. If there is a chance of this happening it is better to name the application or document that links to your content in a clear manner (Start.exe is a good choice) and allow the user to manually launch. USB flash drives can also be used to distribute highly sensitive data and in these cases it is best to encrypt and password protect data to ensure that if the USB key gets into the wrong hands the payload will not be compromised. A number of options are available here including password access USB sticks, hardware AES encryption built into the USB stick and software that wraps the data and password protects it. Some hardware password protection requires administrator access on the host PC but there are stand alone AES encryption solutions that don’t. Even if all you have is some text documents to distribute its much better to present these as a properly formatted, paginated PDF file maybe with the addition of your company logo and web links, than a loose collection of word documents.